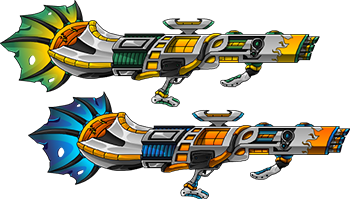 We've fully knocked the safety valves off the pumpkin spice pipeline to flood EpicDuel with a deluge of harvest weapons created by our amazingly talented Guest Artists. 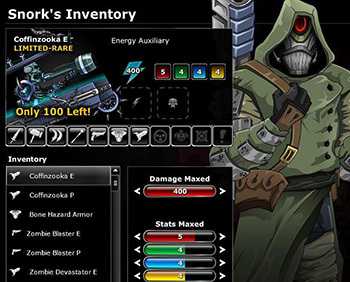 Visit Snork in the Wasteland Minetower for his impressive inventory of spooky seasonal rares created by Bidoof, Vultex, Overlord Drekon, and Assassin Order. 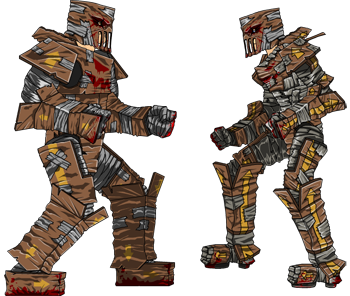 Cut through hordes of ghouls with the Soul Binder mutating sets! 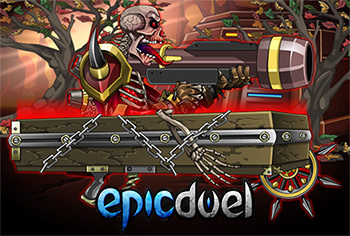 Blast armies of the dead with futuristic shotguns and bazookas! 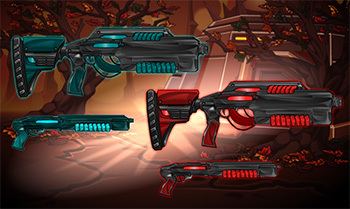 Unleash pumpkin fury with the Pumpkin Annihilator! There is so much content in this release, I'm just going to list all the items here. They are all available NOW at Snork (lower floor of the Wasteland Minetower). 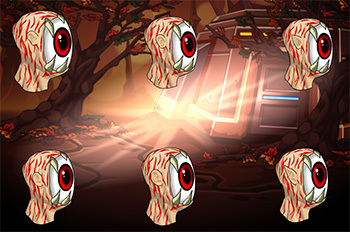 The mutating items are limited quantity so you'd better be quick! 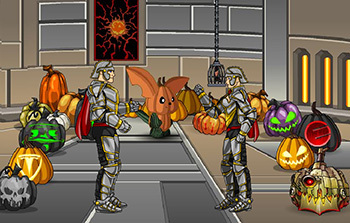 After you've browsed the Snork's shop, you may find yourself with a serious Credit deficit. We've got you covered! Help Hank scare up some business or secure a Frysteland trade route for the Krampus in two new mission chains: Hank's Harvest and Frozen Harvest! These missions offer some incredible Credit, Arcade Token, and items rewards! Our writers Trans and OWA worked hard to make them as enjoyable and rewarding as possible! 2046808 created this...I don't even know what, but it's terrifying. Equip it and scare the life out of your opponents with this profoundly disturbing style. Just don't get any dirt in it. That could be irritating. Join us next week on Halloween for even more deranged content! 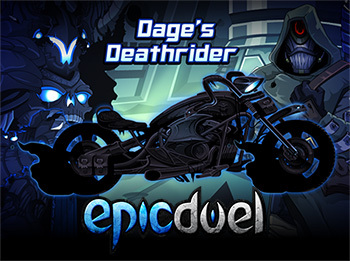 Tear up the roads of Delta V with Dage's Deathrider bike! 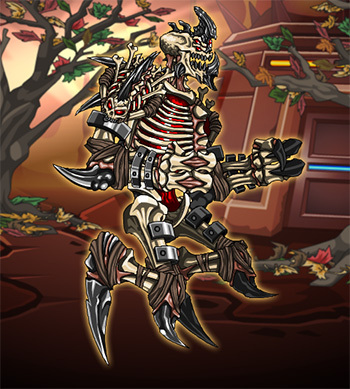 This bike is a limited quantity item and is only available at Dage the Evil's Delta V avatar located in the Wasteland Minetower. Find him quickly before his insidious inventory is depleted! Get spoopy with 12 new styles designed by Bidoof! To improve stability, we've taken steps to prevent the down-time we experienced last weekend. We also fixed a bug that prevented players from saving their home layouts! 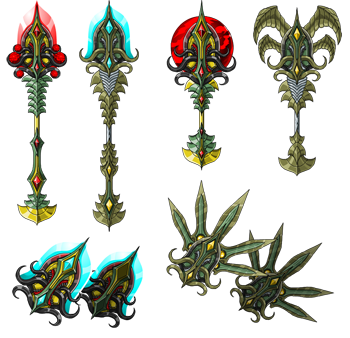 This is just a taste of what is to come -- we're still hard at work on the Harvest 2014 event in EpicDuel which will feature new weapons, armors, mission, and home items for all to enjoy! The Curse of the Phantom Pixel: 12th Anniversary Event! 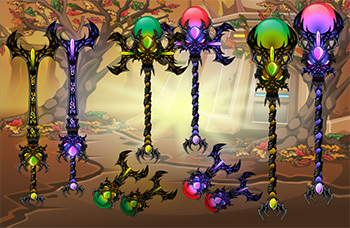 Once you have recovered all 7, talk to Artix to merge them into the Omni Artifact! Battle through Delta V to recover Titan's Coffee Mug! Battle opponents in 1v1 and 2v2 matches, scour the frozen tundra of Frysteland and the barren Wasteland, then take on the boss to gather the shards of Titan's cosmic coffee mug! 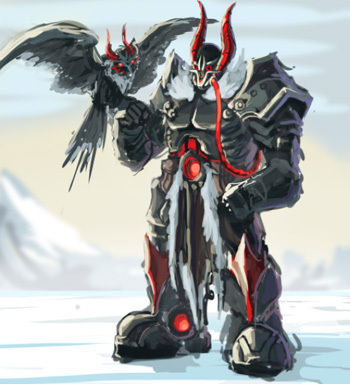 Artix has been cursed, and is stalking the wilds with the ShadowFire Axe of Curses! 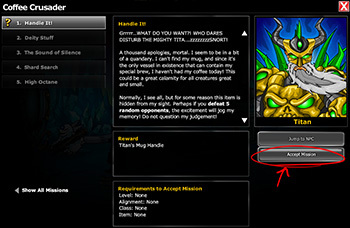 Use the Battle Monsters button to hunt for Artix and the ShadowFire Axe of Curses! Defeat him to unlock a shop to get the Axe for yourself! Capture Thok with the Cursed Phoenix Blade... if you DARE! 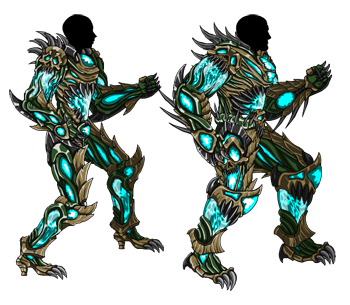 Battle, defeat, and possess Thok and his Cursed Phoenix Blade using the Battle Monsters button! Enter the Wastelands to find a scrap of the Mysterious Necromancer's cloak! Look in your Book of Lore to find directions to the Wasteland. Complete the quest there to find the cloak! The 12th anniversary event is heating up... and so is Hottica's zone! Head to Hottica's zone and battle the Igneos, Rhyolite, Dacite, and Andesite monsters for a chance to find Hottica's Cursed Shield! The Cursed Tape Reappears... will you watch? Work with River to secure the tape before EbilCorp gets their hands on it! Complete the quest to unlock the Cursed Mod Tape! The Ultimate Prize: the OmniKnight Blade! 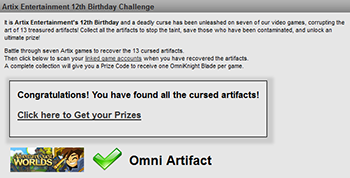 Collecting the 13 artifacts and undoing the curse is a quest for the OmniKnights, our bravest players who play multiple AE games. 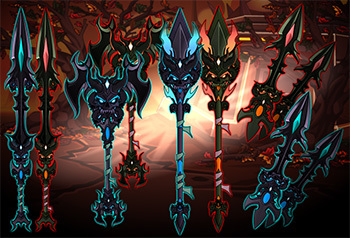 This is not a quest for the faint of heart… but once complete, you will unlock the OmniKnight Blade in ALL 7 of our games! 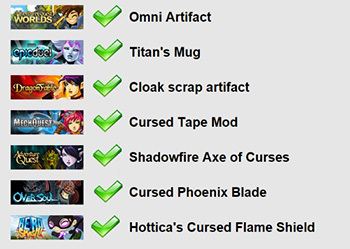 Read on to see what you'll need to do in each of our games to unlock the Blade! Head to the Portal Site and log into your Master Account. Go to the Quests tab to check your event progress. You are looking for 7 green checkmarks. If a game is not checked off, you have not found the artifact in that game. If you DO have all 7 checkmarks, you'll see a box appear saying"Congratulations! You have found all the cursed artifacts!" Click the link that says "Click here to get your prizes!" and you will go to your Achievements tab. You should see "Artix Entertainment 12th Birthday Event" achievement under "What's New?" 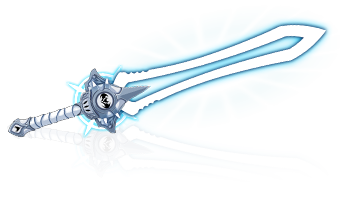 Click that to get your prize code, then go to the "Redeem Codes" page to unlock the OmniKnight Blade in each game! 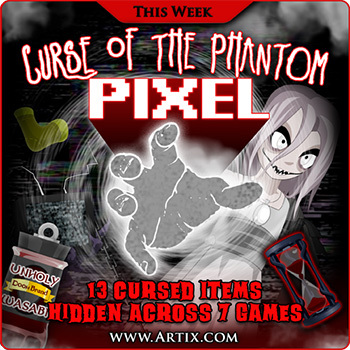 I hope you're all enjoying the Curse of the Phantom Pixel event! 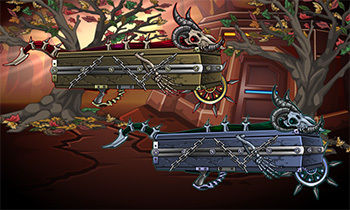 Some have voiced some concern about the EpicDuel portion of the event -- specifically about the difficulty. I realize some may be joining us for the first time, or the first time in a long, LONG time. 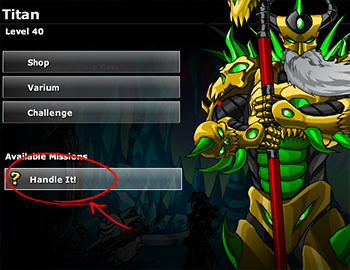 For the newcomers, here's a quick guide for starting the event and completing the Phantom Pixel missions in EpicDuel. This guide is assuming you've already created an account, a character, and completed the tutorial missions. 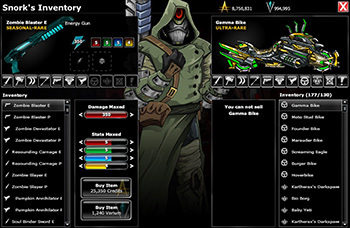 If you needed to create a new character, you will need to complete EpicDuel's brief tutorial -- which will actually teach you a great deal about EpicDuel's mission system. If you already have a character, you will not need to complete the tutorial. First, click on the Mission Log button from your main HUD. This will bring up the mission lists. 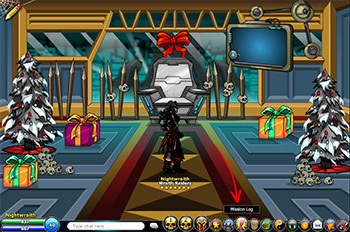 From this interface, you can view all available missions in EpicDuel. They are divided into Permanent, Event, and Daily Missions. The Curse of the Phantom Pixel Mission group is know as Coffee Crusader, and it is located at the top of the Event Missions list. 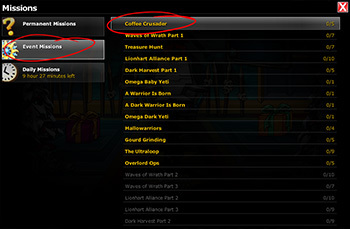 Clicking Coffee Crusader will display all the mission in the group, but you cannot accept the mission until you visit the NPC offering it. Luckily, there's a handy Jump-To button to teleport to Titan. Once on this screen, click Titan to display his options. You see he offers the mission "Handle It!" This is the first mission in the Coffee Crusader chain. Now you can see the complete mission details including all the mission in the chain, mission text, rewards, and the requirements. Click "Accept Mission" when you are ready. Be sure to carefully read the mission text -- while providing flavor for the story, it may also offer more details about how to complete the mission. Confirm Accept Mission. You can only progress on the mission if you accept. For this first mission you must win 5 1v1 battles. Click the Fight 1v1 Battle on the HUD to start a battle. You can go back to the Mission Log at any time to track your progress. Your progress is saved even if you log out. However, if you abort the mission or accept another mission before completing your current mission, progress will be lost. When you have completed the mission, click Complete Mission from your Mission Log, and receive your reward. In this case, your reward will be a mission item. Don't worry, you'll need it for the next mission! Now that you're familiarized with EpicDuel's mission system, the next few should be cake so I'll give a brief rundown of each. If you're ever confused, you can check your Mission Log at any time to re-read mission text, check your progress, and review requirements. For this mission you will need to search for a piece of Titan's Mug. Run from screen to screen searching for something that looks out of place. The item is somewhere in Frysteland so if you're not in Frysteland, you've missed the item. If an object you find is the mission item you're seeking, you will be able to click on it and add it to your inventory. If you've looked everywhere and still can't find anything, check to make sure you're on the correct mission -- scavenger hunt items only appear if the mission is active. Return to Titan to turn in the item and complete the mission. For many players, this will probably be the most difficult and time-consuming mission. To complete it, you will need to win 5 2v2 battles. This is another search mission. Titan tells you to search around Caden. To quickly find Caden, you can click the Map button from your HUD to see the map of Delta V. Clicking on a region like The Wasteland will show all the NPCs in the region. You can jump to any NPC by clicking it's avatar image. You may need a moment to find Caden, but once you find him, you can jump right to him and grab the final Mug piece. This mission will require you to battle and defeat the NPC Talia to get her to drop a mission item. She was reduced to level 5 for this mission to make her easier to defeat for new players. Chances are, after completing the Tutorial missions and the PvP missions, most players will be well beyond level 1. That's all there is to it! 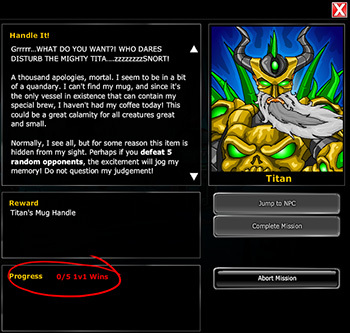 With a little persistence, you'll have Titan's Mug in no time! If you didn't already know, this is the 12th Anniversary of Artix Entertainment. We're celebrating with a company-wide event spanning all 7 games! Dead pixels are dreaded by designers everywhere -- even one dead pixel in a sea of millions is enough to drive an artist mad! Tonight, this bane can be your bounty as you collect 7 cursed items scattered across our games! 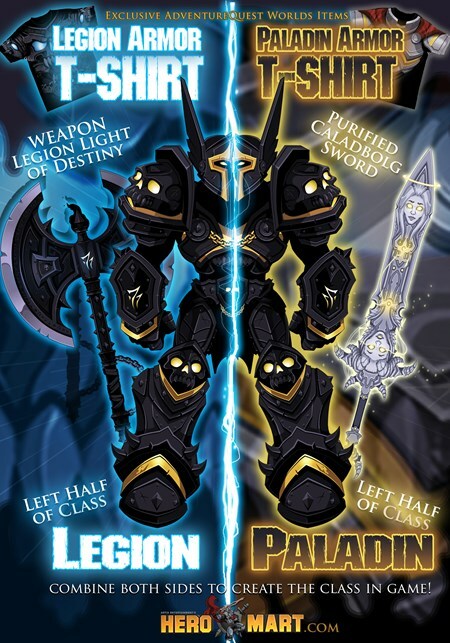 Be sure to check Artix.com to track the releases as they go live! 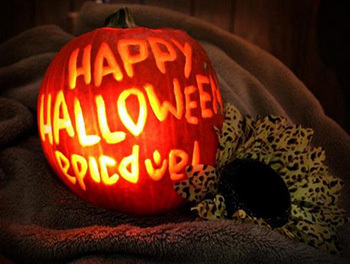 Will you be the first to defeat the curse and claim your ultimate prize? 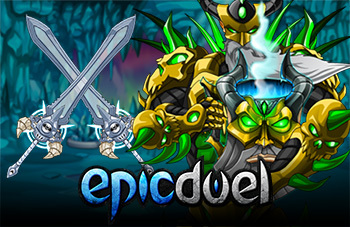 These games, including EpicDuel, would not be possible without your constant support and input! We are eternally grateful for all of your love and generosity through the years to allow us to continue to build new experiences for you every week! Next year is our 13th anniversary? Woah! We're going to need to plan twice as hard to make that event even more awesome than this one! Here's to at least 12 more years -- when you can absorb weekly game updates through your neural spore hivemind uplink! Juicy! Battle On and Duel On! This Friday we are pleased to celebrate Artix Entertainment's 12th anniversary! 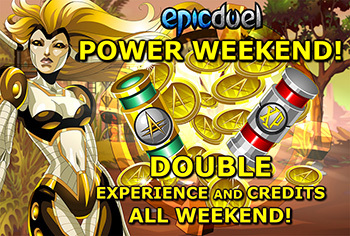 We're celebrating with a massive multi-game-spanning event! In each game, you'll need to collect a special cursed artifact. 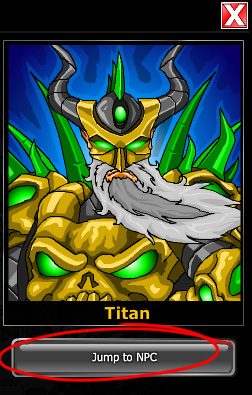 In EpicDuel, that artifact is Titan's Mug. However, you mission will not be so easy as to collect a simple piece of kitchenware. Titan's Mug has been shattered and scattered across Delta V! You don't mess with a mortal's coffee, and that is doubly true for gods. 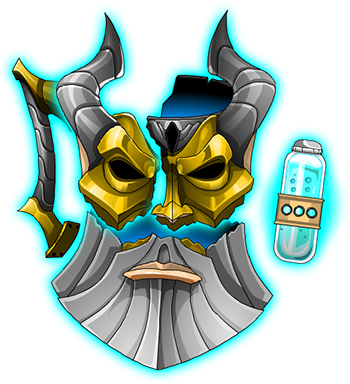 Assemble a Titan's cosmic coffee mug to appease the deity and receive your rewards! Expect us to release tomorrow around 4 PM EST! 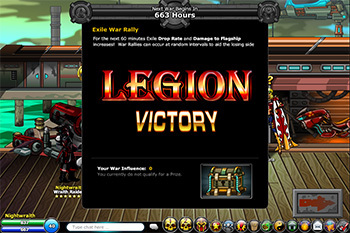 The Naval Yard War is over, and the Legion forces have finally prevailed by maintaining control of the Pirate Flagship. Could this be a turning point in the overall alignment conflict? We'll know for sure when the next regional war goes live in the next few weeks. This was a very hard-fought and very close war, and the prizes were well-earned. We look forward to seeing how the next regional wars unfold in the future! Let the spice flow -- PUMPKIN SPICE! 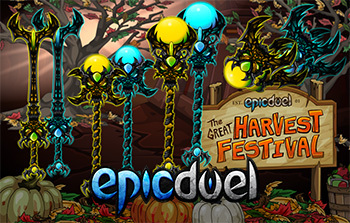 Celebrate Fall and the Harvest Festival in EpicDuel with the return of seasonal Harvest items and missions! 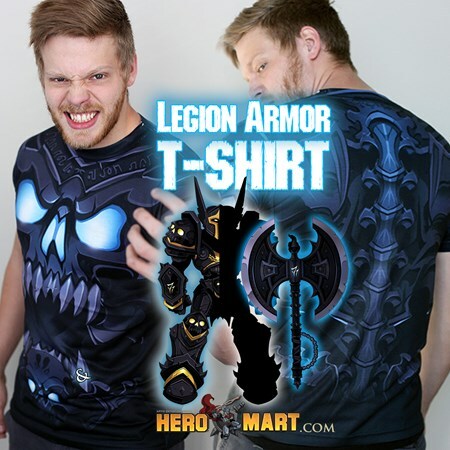 These awesome items are available NOW at Snork! Be sure to pay him a visit in his Minetower basement lair. He gets so lonely down there! 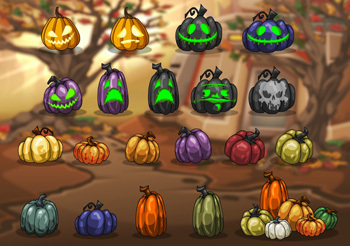 Remeber, the Harvest Reaper and Spectral Reaper mutating items come equipped with the Jack-O-Fire core! Make it rain with a lethal shower of exploding pumpkins! 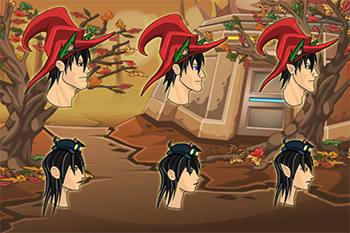 Speaking of pumpkins -- decorate you home with the myriad fall styles already available from the Home Item shop! You may have defeated the pirates, but there's still loot to be had! 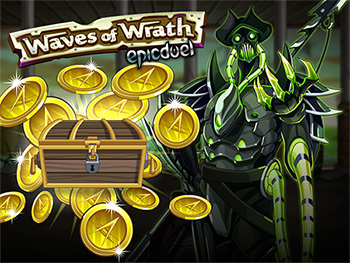 Experience a new supplemental mission chain from Ishmael the Treasure Hunter to unearth the Naval Yard's hidden bounty! After one week the Naval Yard war is still underway and at this point both sides look to have an equal chance of seizing control. I mean...the winner gets a whole pirate ship! How awesome is that? Also, the top prize is a fully color custom version of Captain Shoggoth's armor! Awesome! Follow us on Twitter? 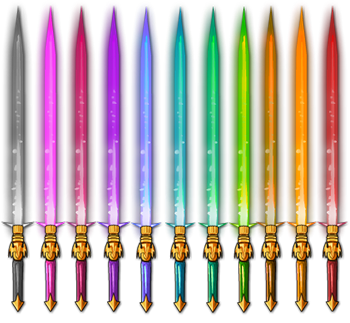 There's a better reason than ever because we'll be issuing new codes from Twitter offering an array of Saber Swords over the weekend and throughout the week! Can you collect all the colors? There are 18 in total so you'll need to be quick!